Built at Kingston Shipbuilding Co., Kingston, Ont, she was launched in 1917 at Kingston, Thiepval was in commission between 24 Jul 1918 and 19 Mar 1920, when she was turned over to the Department of Marine and Fisheries as a patrol vessel.  Taken back into the RCN, she was commissioned 02 Apr 1923, for service on the west coast. 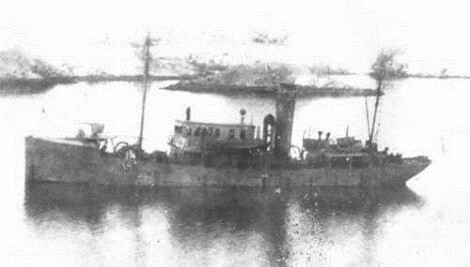 In Feb 1924, one of the few ships in the post-First World War Royal Canadian Navy, Thiepval became the first Canadian warship to visit the Soviet Union and Japan when it provided support for a British attempt to fly around the world. She was detailed to proceed across the north Pacific to Hakodate, Japan, to deposit fuel and lube "dumps" for the round-the-world flight of Maj. Stuart MacLaren. Travelling over 11,000 miles in the process, Thiepval also salvaged what remained of the aircraft after it was wrecked at Nikolski, USSR, on 03 Aug 1924. 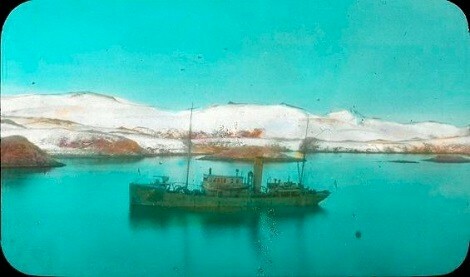 Thiepval was wrecked on an uncharted rock in Barkley Sound, B.C., on 27 Feb 1930. 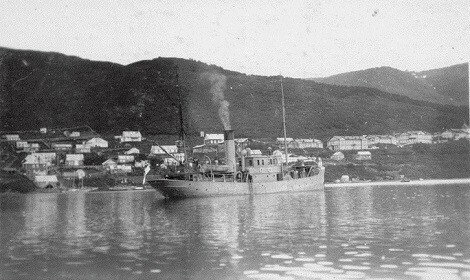 Nazan Bay was one of HMCS Thiepval's last stops before the diminutive trawler crossed the north Pacific on the way to the Soviet Union and Japan. This hand-coloured photograph gives an idea of the barren shores Thiepval would visit during this 1924 journey. A secret component of the mission involved examining Alaskan and northern Japanese ports to determine whether the United States or Japan was contravening the 1922 Washington Naval Treaty by fortifying these areas. Reports by Thiepval's commander, W.R.J. Beech, detailed resources, the presence of military or government officials, and the state of communications in several northern ports. Members of Thiepval's crew maintain the ship's main armament, a 12-pounder cannon mounted on a platform in the bow. 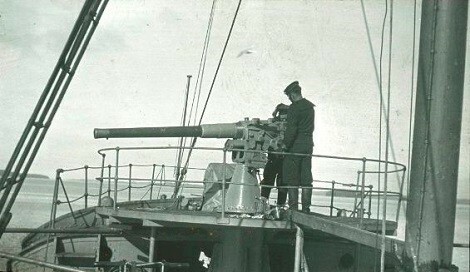 Thiepval's limited weaponry was sufficient for the ship's peacetime patrol work. 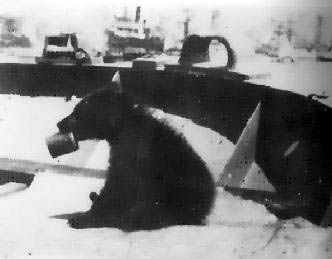 After being transferred to the west coast from Halifax in 1919, Thiepval's duties included counting seals, patrolling against rum-runners, and ensuring that American fishing boats did not enter Canadian territorial waters. Years after Thiepval's 1930 sinking, divers raised this gun and placed it on display at nearby Ucluelet, British Columbia.